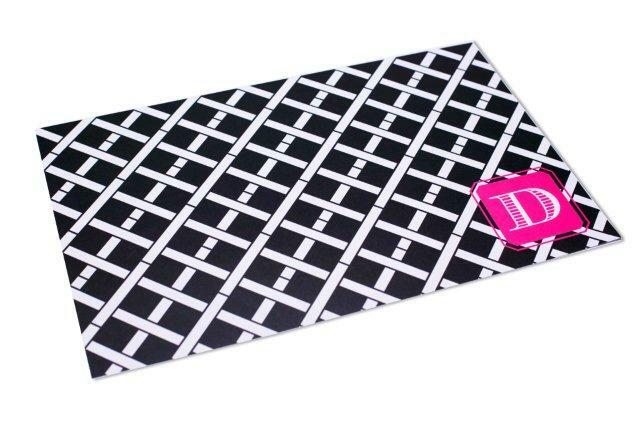 Description: Our paper placemats are a fun way to add instant style to your dinner table. 11" x 17" matte paper placemat set includes 25 with your favorite style swatch, monogram type and monogram color. Use them for lunches with the girls, dinner parties or holidays, they really add chear to any table. Makes it easy to change the look of your table without investing in fabric placemats. Can be personalized with a name or greeting ("Smith" or "Happy 50th, Mary") if space allows. It is a perfect gift for a bride-to-be or someone who loves to entertain! Background design (style swatch) is as shown, but you have your choice of any Dabney Lee monograms (see other other samples) in any of these colors: Hot Pink, Coral, Tangerine, Sunshine, Grass, Robin's Egg, Ocean Blue, Sky Blue, Navy, Fuschia, Chocolate, or black.